LINGSHUI, China (VN) — The 2018 Tour of Hainan stopped last night at Xinglong’s Hilton Doubletree, a luxury resort that features a pool connected to the cyclists’ balconies. Life could not improve for budding cyclists racing a well-organized HC stage race on China’s resort island and hoping to make the big leagues. The peloton in Hainan, an island off of China’s southeast coast, features top professional continental teams. Mostly Chinese riders and Italians fill the ranks, but the race also includes one American Tyler Williams (Israel Cycling Academy) and three British cyclists. “Hainan is absolutely beautiful,” said Brit Tom Fitzpatrick, who races for Taiwan’s RTS Racing Team. 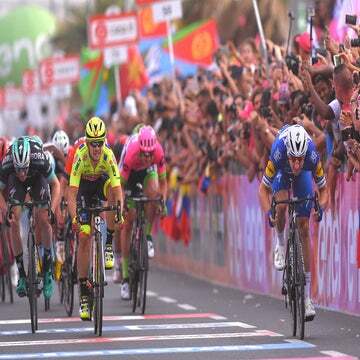 The riders from cycling’s second and third division teams – professional continental and continental ranks – prepared for the fifth stage on the Island’s south as a brief rain shower passed. The tropical climate here is similar to nearby Vietnam’s. “It’s a good way to end the season, it’s a nice race, and it makes the off-season shorter,” Samuel Brand (Novo Nordisk) said. Brand, like Canadian Mike Woods, made the switch from running to cycling a couple of years ago. Hennessy is sprinting, Brand is fighting for escapees, and Fitzpatrick, like all three Brits, is gaining experience for 2019. “I started doing amateur races in Spain, I work as a cycling guide,” Fitzpatrick said. “I did a few amateur races there, did amateur races in the UK and at the end of the July, I got an invitation to race with a team in Poland, my first UCI race, and I absolutely loved it. I got another opportunity off of that to race in Turkey with a British team. The Tour of Hainan began in 2006 and helped several riders launch their careers. Overall winners include Moreno Hofland (now with Lotto-Soudal) and Sacha Modolo (EF Education First-Drapac). The three Brits are hoping for the same. The race spans nine days and gives plenty of opportunities for sprinters like Jakub Mareczko (Wilier Triestina-Selle Italia) and Andrea Guardini (Bardiani-CSF), and offers mix-mountain days for climbers and escapees. Hennessy, who towers at 6-foot-3, prepared next to the Chinese Mitchelton-BikeExchange. His team-mates in Hainan include four Chinese riders and Colombian Brayan Chaves, younger brother of Esteban Chaves. “It’s my first time to really try to get anything in bunch kicks and most of the stages here are bunch kicks. The racing is new. Racing against Mareczko and other top sprinters, they are there in WorldTour finishes,” said 22-year-old Hennessy. The Tour of Hainan marks the last race of the year and new chapters for all three Brits. Hennessy signed with a U.K. team for 2019, which still is to be announced, Brand signed a new 2019 contract, and Fitzpatrick said he remains open to offers.